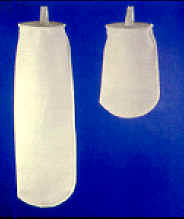 POMF Filter Bag (Polymicro® Microfiber) Series from York Fluid controls is offered in many sizes, materials and finishes. The POMF Polymicro® Microfiber Filter Bag provides outstanding performance on contaminant applications where the minimalization of particle travel is important. The POMF contains three layers: a pre-filtering layer that removes coarse debris; the primary layer, composed of micro pores (for efficient particle retention); and an outer cover that prevents fiber migration. The extractible free fibers are non-foaming, which is ideal for food, beverage, water, chemicals and coatings applications. he hydrophobic surfaces absorb oil from air, gas and aqueous streams. Microfiber offers product cleanliness, higher through-put and longer service life. 80% + void volume means longer service life, higher contaminant loading and reduced waste loads. POMF 1A, 2A, 10A and 25A bags are made from FDA-compliant materials (the 90A and 0A bags include non-compliant materials. 0A bags also include an additional layer of oil removing material). The unit compacts to small volume to reduce disposal cost, or is incinerable. The dimensionally stable material provides more consistent performance. The Polyloc™ top is standard on the FSI filter bag, creating a hermetic seal within a vessel housing to prevent liquid bypass. The York POMF Series High Performance Liquid Filter Bag is over 90% efficient at their suggested application rating. The filters are rated using a challenge of AC Test Dust in water, and a controlled flow rate up to 10 GPM. Efficiency data represent initial efficiencies only. The York POMF Series High Performance Liquid Filter Bag can also absorb unwanted trace oils that frequently occur in processed fluids. The high amount of surface area due to the Polyporpylene microfiber construction, results in oil holding capacities from 10-20 times the filters own weight. The York POMF Series Liquid Filter Bag is available with a stainless steel ring, E-Z Grip collar, plastic or rubber rings. The POMF Liquid Filter Bag complies with the FDA regulations governing food and beverage contact.